Yesterday, I firstly found this funny picture from a Chinese IT guy's blog, dubbed Keso's blog, and then traced back to its original post at Keepwalking's blog. 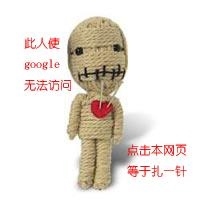 The Chinese words beside the doll in the picture read "This guy caused Google inaccessible. Click this page to sting him" in English. I have noticed that a lot of bloggers at DoNews.com, where the above two blogs reside, have added this sign and its link on their homepages. So far, more than 1300 visitors have "stung" since 13:12 8 June 2006, as the counter showed in the original post. Many supportive comments followed up as well. It seems a creative but actually helpless cure for the helpless netizens in China who are NOT able to access the Internet freely. In Chinese culture, for the common people especially the vulnerable group of them, this would be the most extreme approach to express hatred or curse a person, in which a doll is used to represent the person to be cursed and the people puncture stingers into its body particularly the heart. This is called "巫蛊" (Wu Huo) in Chinese. Finally, a few excerpted words about DoNews.com. DoNews.com, established in April 2000, "advocates the spirit of freedom, fairness and open", claims itself "the largest IT writing community in China" which "consists of 13 thousand editors, journalists, free writers and IT employees as its columnists and forum users."